The best french fries are made with fresh potatoes and fried twice. A chemical reaction happens to the surface of the fries after the first frying, which allows for extra crispness during the second frying. No matter how long you fry the potatoes once, it will not have the same crispness. The best fries NOB are 5 Guys Burgers and Fries and, in the original Coney Island store, Nathan's. Both fry their fries twice. Does any place lakeside fry their fries twice? They all will if you ask them to do it. Ask for "bien doradas" or "doble doradas" and they'll come out crispy. I don't know if they fry them twice, but I love Tony's french fries with his beef or chicken burger. They are my favorite so far in Mexico. What you fail to state is that 5 Guys Burgers cuts their frys fresh daily from Idaho Russets that are stacked in bags around the premises. As you will notice when shopping in MX, potatoes are very different there! For a quasi chain, I would agree that they offer some of the best. I have asked for extra crispy from In 'N Out, and it is not the same as frying twice. How long do you have to wait before the second fry? Or the refry? 2. 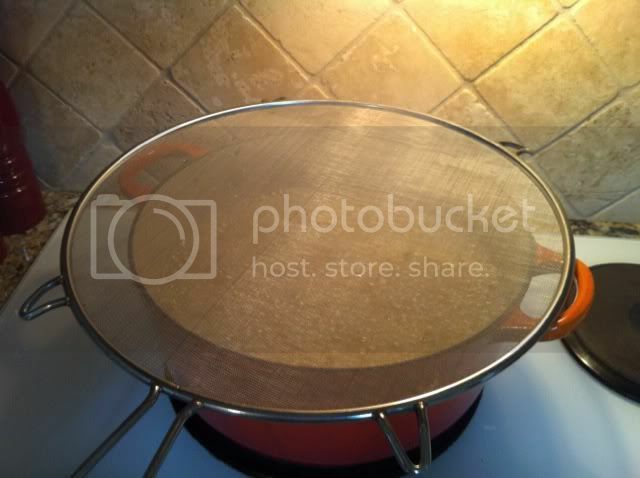 In 5-quart pot or Dutch oven fitted with clip-on-the-pot candy thermometer, or in larger electric fryer, heat oil over medium-low heat to 325 degrees. As oil heats, add bacon grease. 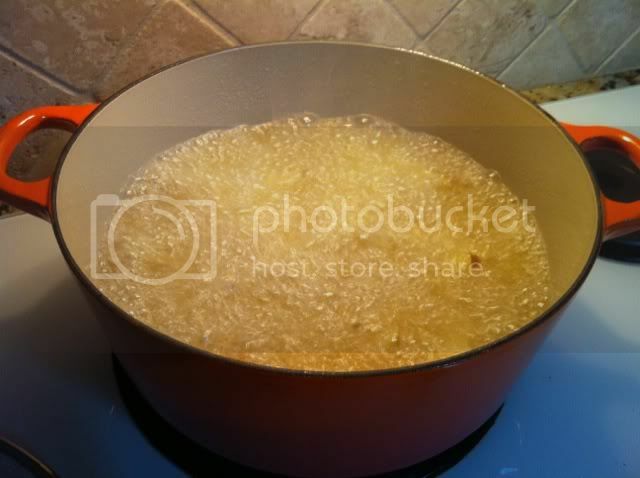 Oil will bubble up when you add fries, so be sure you have at least 3 inches of room at top of cooking pot. 3. Pour off ice and water, quickly wrap potatoes in a clean tea towel, and thoroughly pat dry. 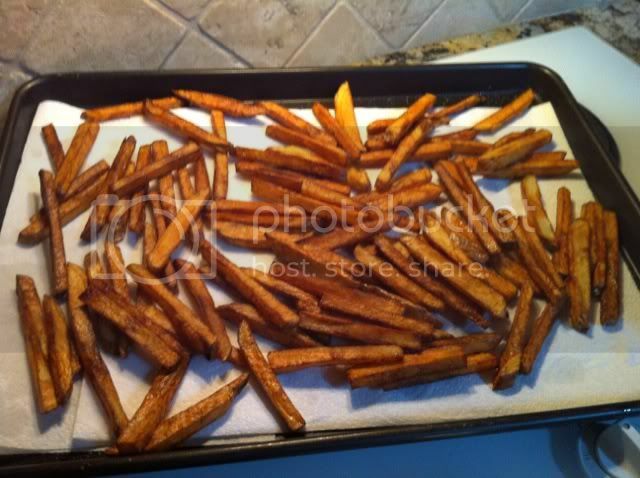 Increase heat to medium-high and add fries, a handful at a time, to hot oil. 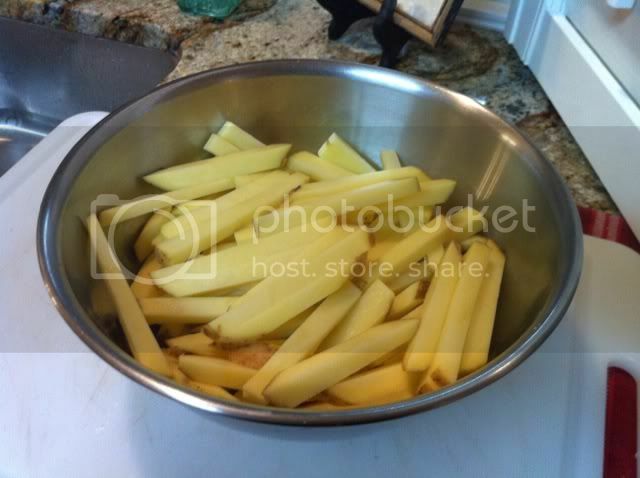 Fry, stirring with Chinese skimmer or large-hole slotted spoon, until potatoes are limp and soft and start to turn from white to blond, 6 to 8 minutes. (Oil temperature will drop 50 to 60 degrees during this frying.) Use skimmer or slotted spoon to transfer fries to brown paper bag to drain; let rest at least 10 minutes (can stand at room temperature up to 2 hours or be wrapped in paper towels, sealed in zipper-lock bag, and frozen up to 1 month). 4. When ready to serve fries, reheat oil to 350 degrees. Using paper bag as a funnel, pour potatoes into hot oil. Discard bag and set up second paper bag. 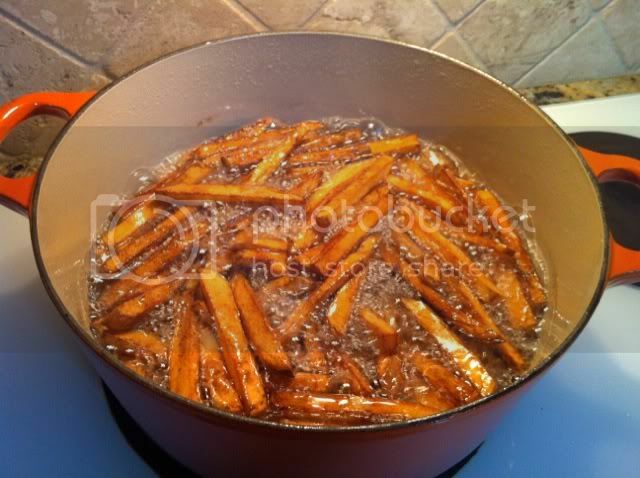 Fry potatoes, stirring fairly constantly, until golden brown and puffed, about 1 minute. Transfer to paper bag and drain again. Season to taste with salt and pepper, or other seasoned salt. Serve immediately. 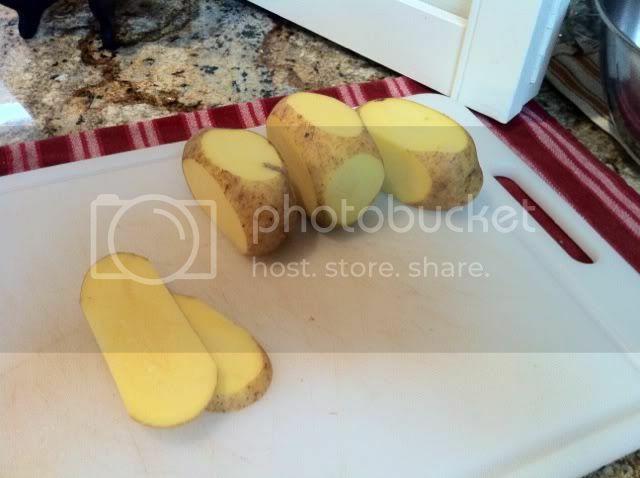 iHere's a recipe I found on the internet using Yukon gold potatoes, which are more similar to local potatoes than Idahos. They only fry once, which surprises me. However I do trust America's Test Kitchen, the most reliable source in home cooking, so maybe this can work. 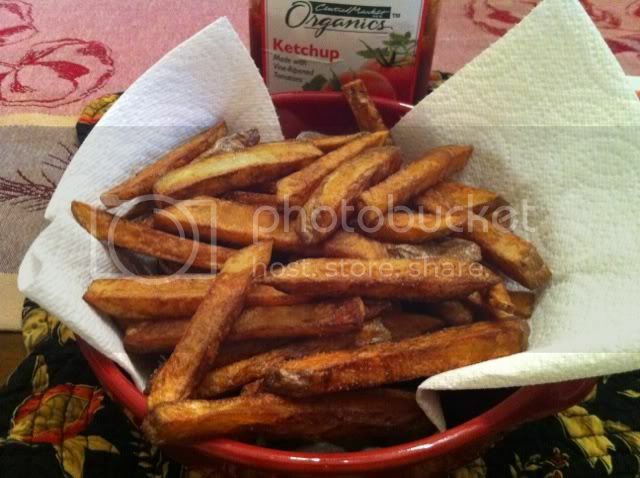 Cold oil french fries: you know you're intrigued! What is this "cold oil" french fry I speak of? It's been years since I made my own fries--by frying, not oven fries--so I went to the best source I know, America's Test Kitchen, for a good recipe. I came across one called "Easier French Fries" which starts the fries immersed in cold oil. My initial reaction was, "gross, WTF??" But damn if they didn't come out close to perfect. I'll post pics first and post the recipe separately. Bring oil to rolling boil on high. 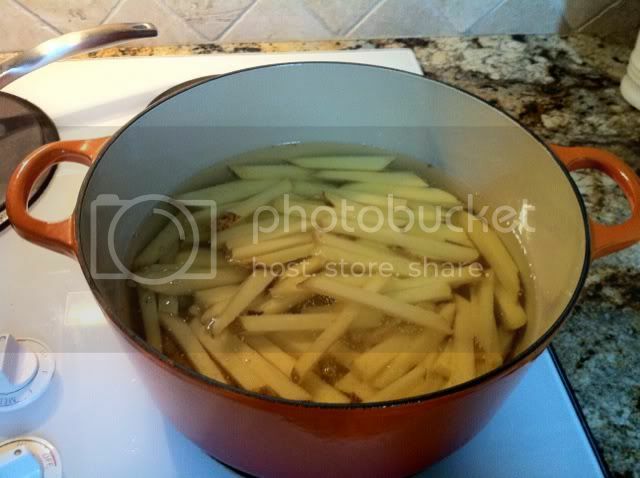 Continue boiling in oil until fries start to soften, about 15 min. (do not stir) A giant mesh splatter screen comes in handy. I am inclined to think that if french fries are a serious concern to you, then Mexico might not be a right choice for you. Actually, potatoes are generally much better here. You get a lot of "In 'n Out" quality fries Lakeside, fresh potatoes fried once. This is better than frozen potatoes, even though frozen can be crispier. Also, I love the mashed potatoes in many places here. It is rare not to get powdered potatoes in your mashed NOB. We are not Lakeside, but Hamburguesas Richards, in Morelia, does twice fry its French Fries. Not as golden brown as those shown in the post above, but they can be requested that way. 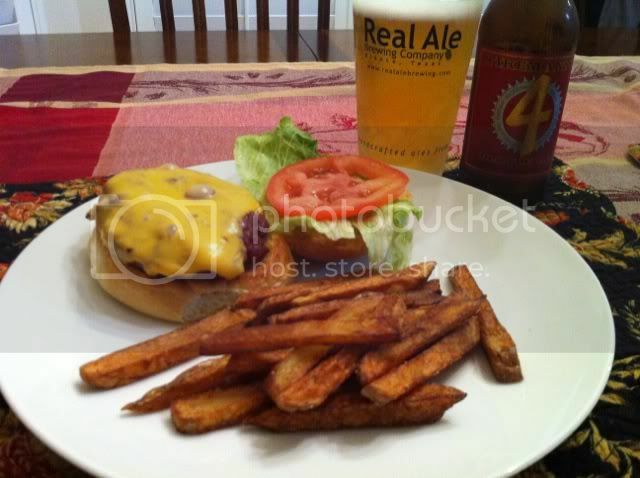 The hamburgers are the closest to an American style hamburger of any I've had in Mexico. I read somewhere that you're supposed to wash them after cutting. Something about removing the starch. Then I read, the best way to make your own are on the BBQ. They come out crispy on the outside and soft on the inside. The recipe said to lay them in oil and watch to make sure the oil doesn't catch fire. However, since I detest the taste of oil and was using pre-cut fries I just threw them on the grill (on a cookie sheet) (trying to not use the oven that much) and watched them. Best at home fries I've ever had. Those aren't French fries. French fries are those greasy skinny unhealthy things one finds in American style corporate fast food houses of horrors. What you have there are honest to goodness chips, cut thick and deep fried to perfection. Top marks to you. They've been called French Fries since long before there was any fast food corporations in the USA. Chips are crispy and come in a plastic bag. But chips in the UK are french fries in the US - and they are also chips in New Zealand and other parts of the world. 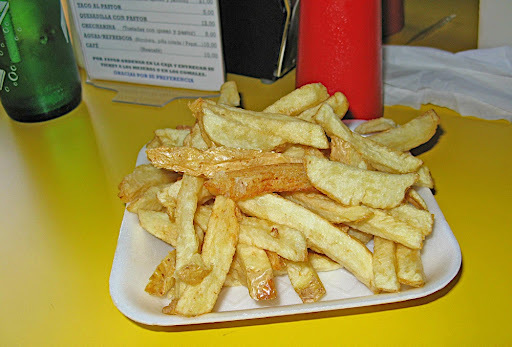 US chips are known as crisps in the UK and other parts of the world. Widen your horizons David! I know that. My point, apparently not made well, was that there have been French Fries (damned good ones) in the USA for many decades before MacDonald's et al.